The history of Andalucia starts back early, in the prehistoric times it was a privileged place which occupied the south of the peninsular and its rich minerals and agriculture which made it a focal attraction for the different civilizations which appeared throughout history. It was the Greeks and especially the Phoenicians which settled in large groups of population across Andalucia, above all in the coastal areas, they created maritime trade routes with other ancient towns located in the Mediterranean Sea. The arrival of the Imperial Rome would end up conquering the territories and mixing with the local populations, they settled in towns using the coast for the production of Garum (popular sauce made from fish to spice food) and its previous trading with Rome. The arrival of the Germanic Vandals and the Visigoths after the fall of the Roman empire didn’t manage to separate the cultural ties of Andalucia, keeping itself independent from the ancient kingdom of Toledo, which until 711 the Muslim conquest would break all possible relation with the north of the peninsule, converting the southern area into Al-Andalus and Cordoba in its capital, cultural and economic centre of the world of that time. The name of Andalucia comes from that period “Al-Andalusiya’ (Arab adjective refering to Al-Andalus) the same as the colours of its flag. During the 10th century the crisis of the Al-Andalus kingdom and its centralization of power caused the attempt of invasion from the Christians in the north of the peninsule and the subsequent division of the Taifa kingdom, with the United Nazari Granada which had a historic role. The Castile Crown kept invading and conquering the southern lands until in 1492 and after the conquering of Granada ended the long Arab rein in the south of the peninsula, after which they tried to evict the andalusian people, although according to historic facts two third part managed to evade eviction by posing as Christians. Andalucia and Spain in general lost the world level importance which they had in the past because of the borbonic reformations which could be understood as the ambition of the riches of the peninsular over the conquered lands, which would produce the loss of the different spanish colonies and even nearly lost Andalucia in the known separatist conspiracy of Duke Medina Sidonia, which would be discovered before it took place. Already in the 20th century, Andalusia was considered an Autonomous Region inside Spain, although always with a great cultural difference and a same language that contains differentiated nuances of Spanish in its pronunciation. Andalusia has its own historical nationality with its own culture and a personality that amazes all the tourists that decide to visit it. Today it’s the most populated Autonomous Region in the Spanish territory and one of the favourite places to spend the holidays for a great number of tourists every year. With a Mediterranean climate that is characterised by a dry climate during the summer period and a mild temperature all year round, with rainfalls during the winter, autumn and spring. In the Andalusian territory there is a wide variety of climates that cause a rich contrast in the landscape, differentiating such near provinces like Seville and its hot summer and its cold winter, to Malaga with its mild climate all year round or Granada with its Sierra Nevada, where one can ski on its snowy peaks during the winter. Andalusia’s climate makes it have a flora adapted to the long periods of drought during the summer months and the forest of Andalusia has been artificially modified by the historical occupation that has suffered over the centuries with the creation of lands for cultivation and the abundant forest fires. Andalusia hosts a wide variety of animal species with great carnivores like the wolf and the Iberian lynx, the wildcat, the deer, the flamencos and the imperial eagle and many more that are added, others introduced in the recent history involuntarily like the parrots or the river American crab and others now extinct like the bear that disappeared. Andalusia offers a great amount of natural parks that are well worth a visit amongst which we must mention the National park of Sierra –Nevada, Doñana, the Natural park of Cabo de Gata and the Sierra de Cazorla. If you’re interested in nature you can visit our section on Natural Parks in Malaga. Andalusia is well communicated by roads and other ways of public transport like the train. 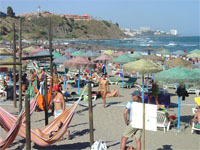 It also has important airports with international traffic like Malaga airport or Seville airport, the two most important ones, as well as Malaga port with a history that dates back to the Phoenician occupation and that is currently a stopover point for the cruises around the Mediterranean. Fishing has been and is one of the main activities on the Andalusian coasts, from the Phoenicians, passing through the Romans, the fishing sector develops an important role in the economy and in the Andalusian diet, being the fishing fleet the second most important inside the Spanish territory after Galicia. The tourism in Andalusia is very important, being the first tourist destination in Spain for the Spanish tourists and one of the first if we bare in mind the international tourism. Andalusia is a very popular destination amongst the Nordic countries, being the visitors from the UK, Germany and Holland the main interested in the climate and the beaches of Andalusia. If you wish to visit Andalusia, you must know that the highest concentration of tourists is during the month of August, while the month of December is the month when less tourists visit. If you wish to learn more about festivities and cultural events, you can visit our website on the previous link. With a rich and varied gastronomy, Andalusia offers a Mediterranean diet based on the olive oil, vegetables, fish and meat. The fish and the seafood is very extended all along the Andalusian coast, being perhaps one of the main tourist attractions in Andalusia for the tourist that visits it for the very first time. Another one of Andalusia’s attactions is its cured ham of Sierra Morena, the Iberian ham of Huelva or Sierra Nevada, of contrasted quality. The confectionary has been enriched over the centuries with a strong Andalisian influence in the use of almonds and honey. It’s typical to eat ‘churros’ in the mornings or try out the traditional Christmas cakes called ‘polvorones or mantecados’. The Andalusian wine is another of the characteristic elements of the region, being the production of wine, liqueurs and vinegars very important in Andalusia. Amongst the Andalusian wines we’ll find the Sherry, County of Huelva, Manzanilla-Sanlucar de Barrameda, Malaga, Montilla Moriles and Sierras de Malaga. Andalusia covers a wide area of southern Spain that you’ll be able to visit easier by car. If you arrive at Malaga you may be interested in car hire Malaga with us, we are a company with many years of experience in the sector that offers top quality and good prices to its clients. Discover Andalusia with the map below, or check our map of Andalucia with other maps of the provinces.